aLinux (formerly Peanut Linux) was an independently developed Linux distribution with RPM package management. Rate this project Glen MacArthur has announced the release of AV Linux 6.0.2, a new build of the project's Debian-based distribution with a large collection of audio and video production software: "This new 6.0.2 version contains significant changes including a complete new customized Xfce 4.10 desktop environment, the 'pipelight' browser plugin giving access to DRM Silverlight content (i.e. Netflix) through your web browser, embarrassingly copious amounts of great LV2 audio plugins, updated FFADO drivers, additional handy Nautilus scripts, exfat-fuse support, MTP smartphone and tablet support, updated and improved documentation, LibreOffice 4.1, and the very best multimedia content creation applications all updated, tested and provided ready to use. Enjoy the latest Ardour, Mixbus (demo), linuxDSP (demos), Qtractor, Carla, DISTRHO plugins, X42 plugins and much more." 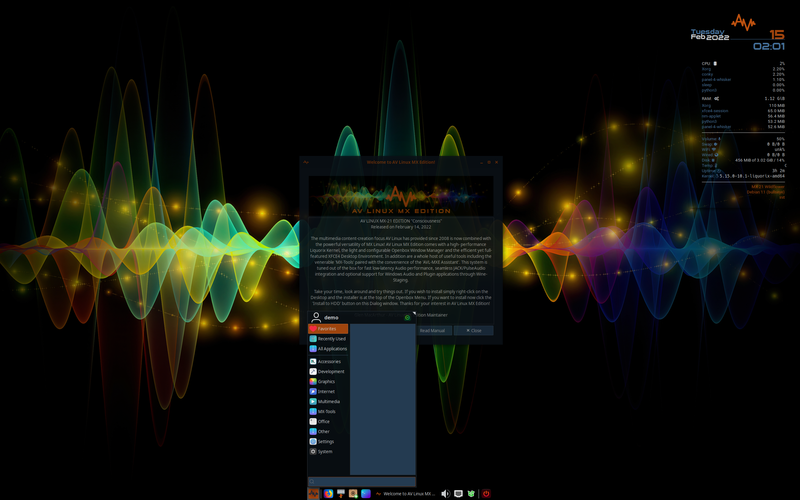 Read the rest of the release announcement for more information and a screenshot of the default desktop. 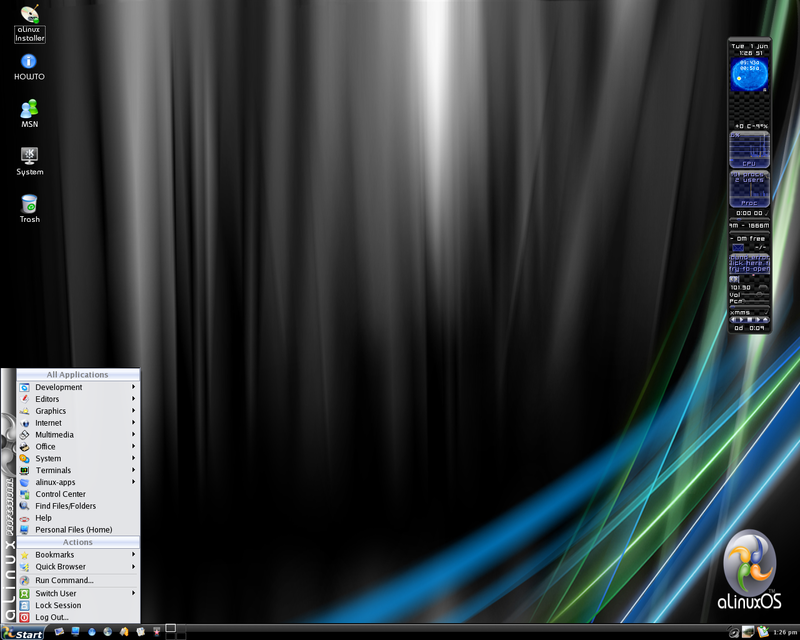 Download: avlinux6.0.2-xfce410-i386-en.iso (2,960MB, MD5, torrent). Glen MacArthur has announced the release of AV Linux 2018.6.25, an updated build of the project's Debian-based distribution featuring a "real-time kernel" (with the PREEMPT_RT patch) and a large collection of audio and video applications. This version brings un updated 4.16 Linux kernel and improved support for newer AMD video cards: "AV Linux 2018.6.25 has been released. The April AV Linux 2018.4.12 release had a lot of improvements and updates with regards to the audio and video applications, but some improvements needed to be made for systems with UEFI booting and systems with recent AMD video display adapters not covered by SGFXI. I personally have no UEFI (or AMD) computers to test with, so I could only use VirtualBox for UEFI testing. Thanks to bug reports from a few users and several fixes provided by a forum member, I think many of the issues for actual hardware UEFI machines have now been addressed. If you have already successfully installed and updated AV Linux 2018.4.12 then you will not really need to be concerned with the updated June ISO images." See the full release announcement for more information. Download: isotester-avl64-2018.6.25.iso (3,558MB, SHA256, pkglist, username: isotester, password: avl64), isotester-avl32-2018.6.25.iso (3,402MB, SHA256, username: isotester, password: avl32).